A recent post on the Whole Dog Journal blog about dogs who watch TV got me thinking about this topic. When the DogTV channel launched, I thought it was a silly gimmick that would appeal to indulgent pet parents but leave the dogs indifferent. I tried out the sample videos on Jana, who had never shown any interest in TV, and felt vindicated when she barely glanced at the screen. And then there was Oriel, who perked up and watched any time a TV show featured a dog. And, of course, Cali. Cali, who is Oriel’s great niece, loves to watch TV. She got hooked, I am a bit embarrassed to admit, a year or so ago when PBS had a short series about different animals’ uh, love lives. Cali was only a year and a half old, and maybe I should have been more careful about monitoring her viewing. She seemed to like the kangaroos the most. In any case, she’s a real fan of animal shows on TV. Recently, I was flipping through channels and paused on a PBS show about cats. Cali was riveted. I had to stay up just so she could keep watching. And she likes ads. Hulu has one that shows lots of inter-species animal friendships — she loves that one. I read in a Popular Science article that newer TVs have a higher refresh rate for the images, so they will appear more lifelike to dogs; images on older TVs have a noticeable flicker for dogs since their eyes are sharper than ours. So maybe the TV-watching dogs of old simply had poorer eyesight than the dogs who ignored TVs, and more dogs are paying attention now that TV technology has caught up with their visual ability. Regardless of why dogs are more interested in TV, the pertinent question is, if we ask the dog to bring us the remote, will we have to negotiate for it? Will the dog demand an equal say in choosing what we watch? I’m all for the occasional PBS nature show, but I’m not about to let Cali nix my “Grey’s Anatomy” fix. 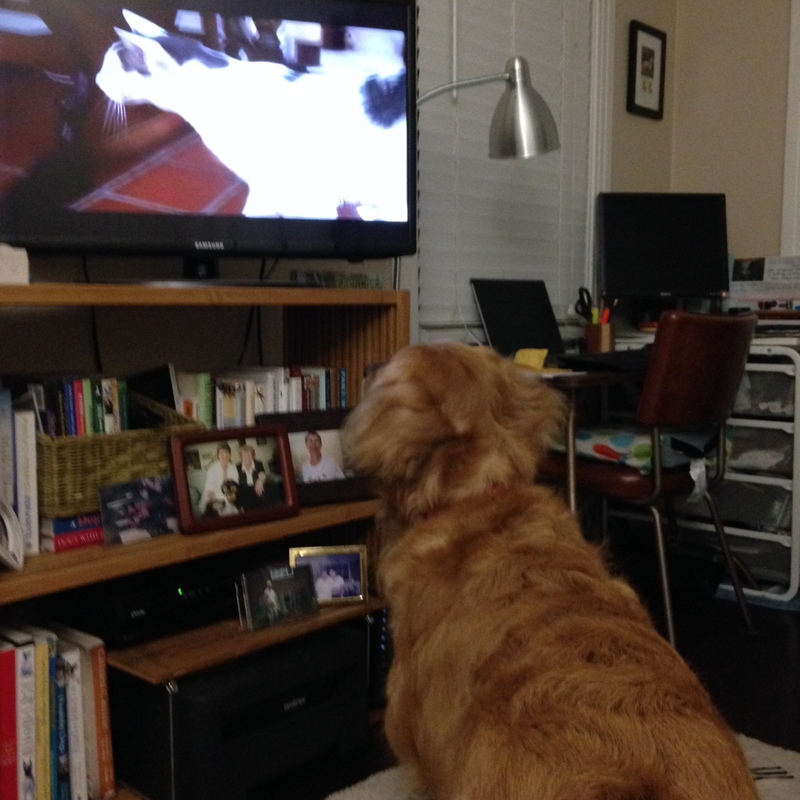 Pam– I also have caught my dogs watching TV at times, but mostly it doesn’t catch their attention. I do recall one time when Weiser was lounging on the couch next to me and a commercial came on that had a close up image of a male lion that took up almost all of the screen. Weiser snapped to attention and stared at the TV lion as if he were watching a real lion and there was cause for concern. He even growled at the TV lion and lifted his lip. When the image went away, so did Weiser’s interest in the TV and he laid back down on the couch and proceeded to doze. BTW: I believe that generally dog vision is not as good as human vision. The exception seems to be that they do better in the dark than we do, but not all of that success is due to vision as they rely more on their other senses for navigation than we do. We definitely have more color distinction and can discern shapes with more clarity. You might find these references interesting. I did enjoy your tale about Cali quite a bit. I am looking forward to meeting her this summer.